Wyndham Sea Gardens in Pompano Beach, Fla.
ORLANDO, FL--(Marketwire - March 10, 2011) - Extra Holidays by Wyndham recently announced a limited time only book early and save promotion. Book a stay at Wyndham Santa Barbara, Wyndham Sea Gardens or Wyndham Palm-Aire in Pompano Beach, Fla. by April 15, 2011 and save 33 percent on deluxe studios from $89 per night. There are also one and two bedroom duplex suites available. Travel May 1 - June 30, 2011. Call 800-670-3620 to book a stay! 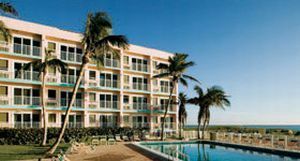 Wyndham Palm-Aire, Pompano Beach, Fla. Situated just ten minutes outside the city of Fort Lauderdale, Wyndham Palm-Aire is a gated resort community surrounded by towering palm trees and lush landscaping. Book by April 15, 2011 and save 33 percent on deluxe studios from $89 per night. Wyndham Santa Barbara, Pompano Beach, Fla.
Wyndham Santa Barbara, located just steps from Pompano Beach on South Ocean Boulevard, is a remarkable vacation paradise featuring a 10-story high-rise tower with a picturesque marina, home to the Serenity yacht. Book by April 15, 2011 and 2011 and save 33 percent on deluxe studios from $89 per night. Wyndham Sea Gardens, Pompano Beach, Fla.
Wyndham Sea Gardens is a remarkable vacation paradise, featuring a 10-story high-rise tower with ocean and Intracoastal Waterway views. Extra Holidays by Wyndham specializes in offering quality vacation accommodations throughout the United States, Virgin Islands, Puerto Rico and the Bahamas. Extra Holidays by Wyndham is a specialized, resort condominium rental operator and a part of Wyndham Vacation Ownership which is headquartered in Orlando, Florida. A subsidiary of Wyndham Worldwide, Wyndham Vacation Ownership is the world's largest vacation ownership business, as measured by the number of vacation ownership resorts, individual vacation ownership units and owners of vacation ownership interests.